Before I go any further, please note that Q-Tips® is a registered trademark of Chesebrough-Pond's USA Co. Also, you should never stick any type of cotton swabs, or indeed anything smaller than your elbow, into your ears. The first cotton swabs were invented in the 1920s by a Polish-born American named Leo Gerstenzang. In 1926, he marketed his invention as "Q-Tips Baby Gays"; eventually, this was shortened to simply "Q-Tips" (the "Q" stands for "Quality"). Q-Tips cotton swabs have become so popular that the brand name "Q-Tips" has achieved the dubious distinction of widely being used generically, in the same way that "Scotch tape", "Jell-O", and "Kleenex" are, to describe similar items produced by other companies. This work is part of a series that Nadège created in 2001 that featured everyday items, like scarves, swimming trunks, and socks, all executed in glass in a very whimsical fashion. 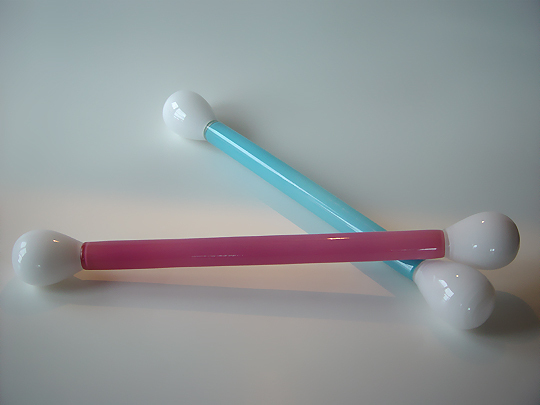 This pair of cotton swabs were created using the incalmo method of joining bubbles of glass together... this is similar to the method that Nadège used to create her two-tone vase. When I saw this work at the Pilchuck Auction, I made sure that I was the high bidder... the idea of two foot long glass cotton swabs is fairly amusing (I also have a glass hammer, a glass screw, and bags made of glass, so why not cotton swabs? ), and I really like Nadège's work. The colors that she has used are very nice, as well. Of course, since cotton swabs are cylindrical, they tend to want to roll... so, they're best displayed propped against each other to limit their ability to move around.